Today was the first day it actually felt like winter in Baltimore. It was cold, gray, and blustery. There were even a few snow flurries throughout the day and, weirdly, a mini blizzard. It’s the kind of day when you just want to hibernate in the house and stay cozy. 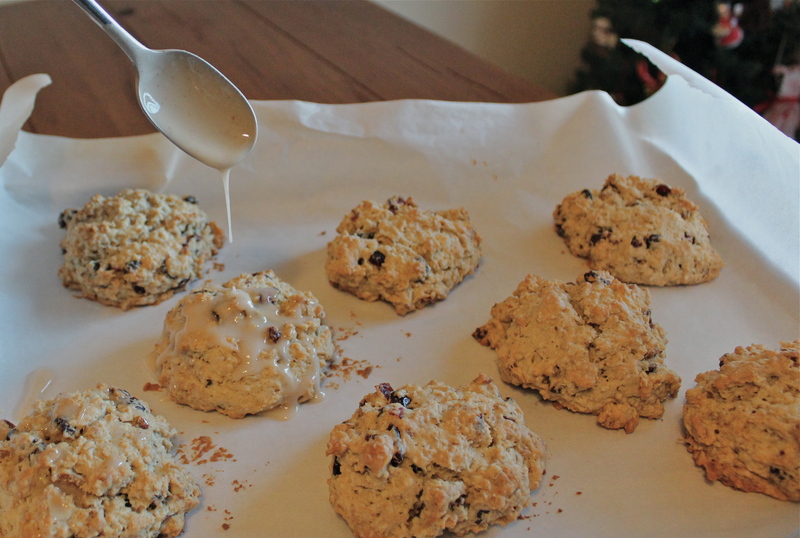 So, in honor of this cold day, I decided to bake some maple oatmeal scones. 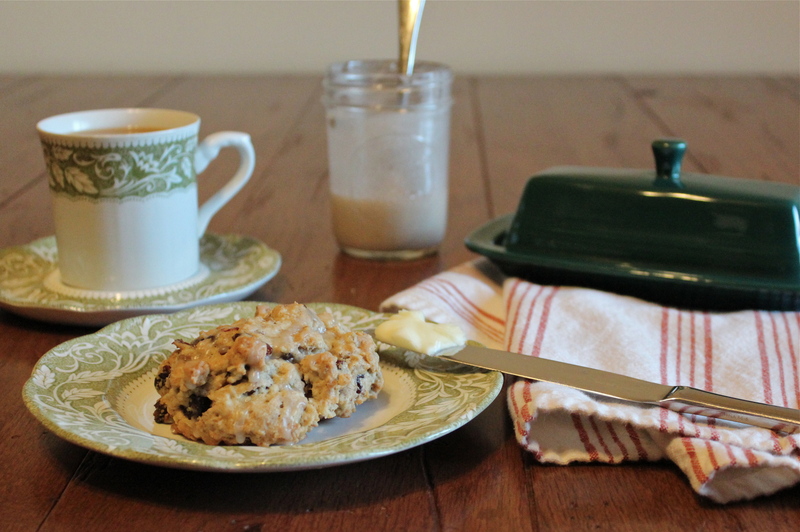 Scones are perfect for a cold, blustery day. They’re warm, tender, and flakey, and feel like little clouds in your mouth. These scones are filled with oats, cranberries, and pecans, and they’re topped with a maple cinnamon glaze. They’re wholesome and delicious, and they’ll fill your tummy. They remind me of a bowl of oatmeal with all the fixin’s, but better because they’re made with butter. By the way, these scones are best served warm with lots of butter. And, if your like me, you’ll want to add a little more maple syrup to finished product- it makes it extra special. Here’s just a few of the ingredients you’ll need to make these scrumptious little wonders. When your finished making the batter, use a 1/3 cup measuring cup to scoop out the mixture onto a parchment covered baking sheet. The scones will bake at 35o degrees for about 30 minutes, or until the tops of the scones become golden brown. While the scones are baking, make the maple glaze. Cool the scones for about 20 minutes before adding the maple glaze. Drizzling the glaze is my favorite part; it’s what makes these scones extra tasty and special. The glaze creates a sweet, crunchy crust on the top of of the scone. When you bite into these bad boys, they’re slightly sweet on the outside and oh so tender on the inside. Enjoy with a hot cup of tea or coffee. And, I promise, they’ll warm you right up on a cold winter’s day. 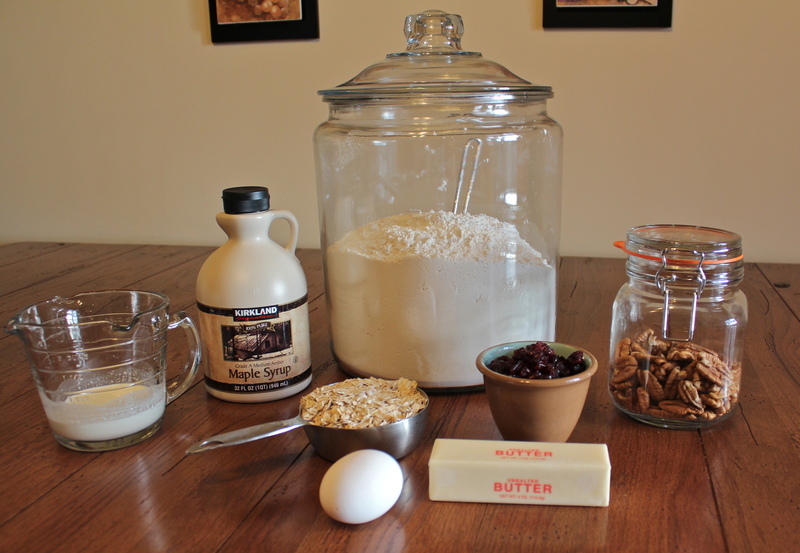 Using a stand mixer fitted with a paddle, or hand held mixer, mix together the flour, oats, baking powder, baking soda, cinnamon, salt, pecans, and dried cranberries on low until just combined. Add the butter and beat on low for about 30 seconds until the butter mixture resembles a grape size crumble. In a small bowl, whisk together the cream, maple syrup, and egg until thoroughly mixed. On low speed, add the cream mixture to the butter mixture and beat for about 30 seconds, just until the dough comes together. Don’t over mix. The mixture will be slightly wet- that’s normal. Remove the bowl from the mixer stand and scrape down the sides of the bowl with a rubber spatula. 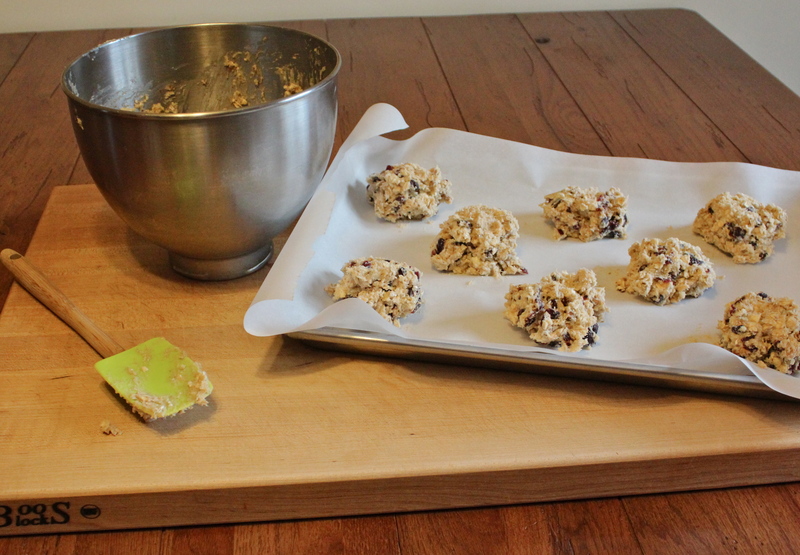 Using a 1/3 cup measuring cup, drop scoops of dough onto a parchment lined baking sheet. There should be enough dough to form 8 scones. Space them 2-3 inches apart on the baking sheet. I fit all 8 scones on one baking sheet; however, if the pan looks crowded you can add some to another baking sheet. Bake for about 30-35 minutes, or until the scones become golden brown. When done baking, let cool for 20 minutes before drizzling on the glaze. In a small bowl, whisk powdered sugar, cinnamon, maple syrup, and water until smooth. Wow, they look AMAZING! i will have to try them! Already added to this weekend breakfast menu! Best wishes on yopur blog! I will be following!!! They look very good and easy to make! The scones look delicious! Will try the recipe. Will follow to see what’s next. I am going to try this recipe too!!!! Oh boy, just looking at them makes my mouth water!!! I am loving this site! Keep up the good work Jenn!!! I’m not going to show this to Mr. Jim for fear that he will want me to start learning how to make all of these fancy desserts…lol! Thank you. I love getting cozy with a cup of tea and a scone. It totally should be a thing. Thanks for taking a peek at my blog. Your site is AMAZING!!!! From the wonderful photos, to the easy-to-follow directions, to the yummy recipes! Love it all!!!!! I just made these tonight.. DELICIOUS. I can’t believe how easy this was for a scone recipe. 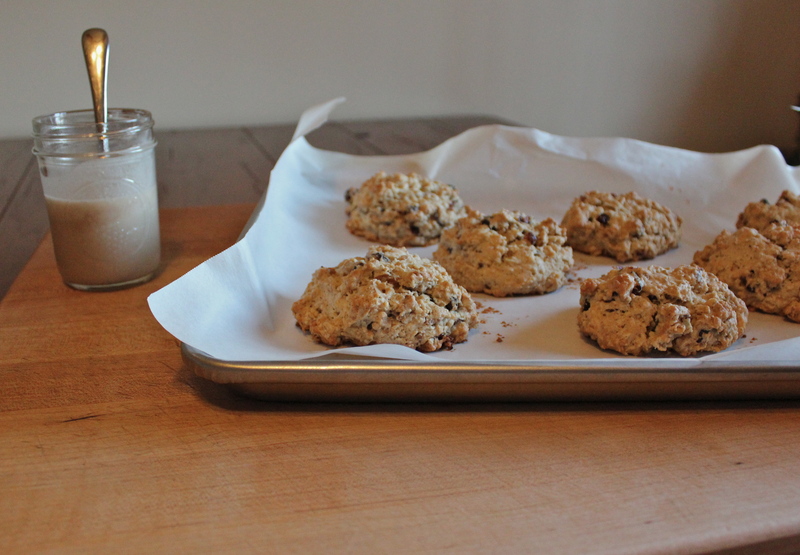 I have a huge bag of craisins I just got from Costco, so I am pretty much making these scones all winter long. Thank you for sharing this gem of a recipe!